5.8 Earthquake hits New Britain, Papua New Guinea. 5.5 Earthquake hits the Hindu Kush, Afghanistan. 5.1 Earthquake hits the Jan Mayen Islands. Raung (East Java): Eruption spewed blazing lava and volcanic ash around 300 meters high into the sky on Sunday evening and was heard 20 kilometres away, and ash fall was seen in villages about 10 kilometres away from the summit. The status has been raised from ‘waspada’ (alert) to ‘siaga’ (high alert). India – The death toll in the recent floods in Gujarat, India has risen to at least 81 people with thousands of pilgrims being airlifted from the Uttarakhand region. Choppers airlifted nearly 8,500 people from the Hindu shrine of Badrinath and the Sikh pilgrimage Hemkund Sahib, located in Chamoli district. Bangladesh – At least 23 people have died in flash floods and landslides triggered by heavy rains that lashed southeastern Bangladesh, officials said on Sunday. Tens of thousands of people were marooned on higher ground as flood waters submerged areas around Cox’s Bazar and the hilly district of Bandarban. Philippines – At least 25,000 persons in 15 villages of Sultan sa Barongis in Maguindanao province have been displaced by floods, which in some areas were as bad as neck deep, officials said. Mayor Ramdatu Angas said the local government has declared a state of calamity in the entire town as flood water from the Ala River has been rising due to the torrential rain in the mountains of Sultan Kudarat and South Cotabato. As far as conservationists can tell, glass sponge reefs remain the only large reef extant from the Jurassic period of the Earth. They have evolved into a natural habitat for many species. In addition, they provide nursery grounds and refuge area for various life forms. That glass sponge reefs of the size discovered in the Hecate Strait which span over 1,000km and measure up to 25m. Glass sponge reefs of this size are exceptionally rare. In an effort to preserve this vital ecosystem, the Canadian Government has moved to designate the glass sponge reefs of the Queen Charlotte Sound and Hecate Strait as Marine Protected Areas. Hundreds of lightning strikes overnight have sparked three dozen new wildfires in Northern California, authorities said Sunday. The 36 blazes triggered by 800 lightning strikes were small and quickly put out, according to the California Department of Forestry and Fire Protection. Meanwhile, about 3,000 firefighters continued to make progress on five large wildfires around the state. 5.4 Earthquake hits Assam, India. 5.0 Earthquake hits Hawaii Island, Hawaii. Invest 90C remains an area of disturbed weather in the central Pacific with potential for tropical development. India – Surprise floods in parts of Gujarat this week have killed at least seven Asiatic lions and more than a dozen big cats remain missing in Amreli, Bhavnagar and Gir districts, officials said on Saturday. As the flood waters receded in the affected areas, forest department officials found the carcasses of seven lions, including that of a three-month-old cub. Besides lions, the floods have also killed hundreds of other wild animals like blue bulls and spotted deer. Afghanistan – Floods in the Sayed Khail district of central Parwan province have displaced more than a hundred families and damaged farmlands. Manam (Papua New Guinea): According to Darwin VAAC, an ash plume from the volcano rose 8,000 ft and extended 70 km to the NE today. The volcano seems to be in a phase of intermittent mild explosive activity. Sangeang Api (Indonesia): Satellite data suggest that a new lava flow is active traveling from the summit crater of Doro Api through a narrow ravine on the SE side of the volcano. It is possible that effusive activity which began in early June last year in reality never ceased, but increased again now. The volcano began erupting with a large explosion on 30 May and several smaller ones in early June last year. This was followed by the effusion of a flow that quickly traveled down the SE slope of the volcano. Thermal signals remained intense until November 2014, then decreased, but did not disappear, but clearly picked up again late April this year, indicating the presence of active lava always in the same path. The current length of the flow is probably around 1.5 km. Dukono (Halmahera): Ash emissions at variying intensity continue from the volcano. Darwin VAAC reported ah ash plume that rose to 6,000 ft (1.8 km) and extended 50 km NE yesterday. 5.2 Earthquake hits New Ireland, Papua New Guinea. Invest 90C in the central Pacific is an area of disturbed weather with potential for tropical development. Pakistan – Flash floods in a mountainous district of Khyber Pakhtunkhwa Province in northwest Pakistan have claimed the lives of at least 10 people. A madrassa and several buildings were also destroyed. Some coral populations already have genetic variants necessary to tolerate warm ocean waters, and humans can help to spread these genes, a team of scientists from The University of Texas at Austin, the Australian Institute of Marine Science and Oregon State University have found. The discovery has implications for many reefs now threatened by global warming and shows for the first time that mixing and matching corals from different latitudes may boost reef survival. The researchers crossed corals from naturally warmer areas of the Great Barrier Reef in Australia with corals from a cooler latitude nearly 300 miles to the south. The scientists found that coral larvae with parents from the north, where waters were about 2 degrees Celsius warmer, were up to 10 times as likely to survive heat stress, compared with those with parents from the south. Using genomic tools, the researchers identified the biological processes responsible for heat tolerance and demonstrated that heat tolerance could evolve rapidly based on existing genetic variation. Worldwide, coral reefs have been badly damaged by rising sea surface temperatures. Bleaching—a process that can cause widespread coral death due to loss of the symbiotic algae that corals depend on for food—has been linked to warming waters. Some corals, however, have higher tolerance for elevated temperatures, though until now no one understood why some adapted differently than others. It isn’t unusual for pythons to eat porcupines, Fuller told Live Science in an email. In fact, many species of snakes eat porcupines and other horned or quilled animals, according to a study published in 2003 in the Phyllomedusa Journal of Herpetology. And while a 30-lb. meal might sound like too much to digest, it isn’t if you’re a python. Rangers found the snake underneath a rocky ledge, where it had apparently fallen. 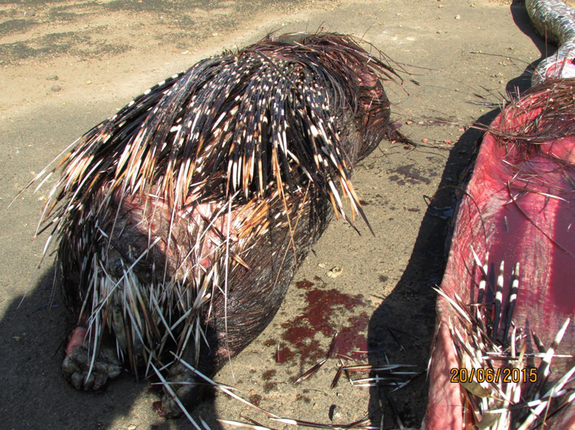 On impact, the quills inside its engorged belly may have pierced the python’s digestive tract, which probably killed the animal. 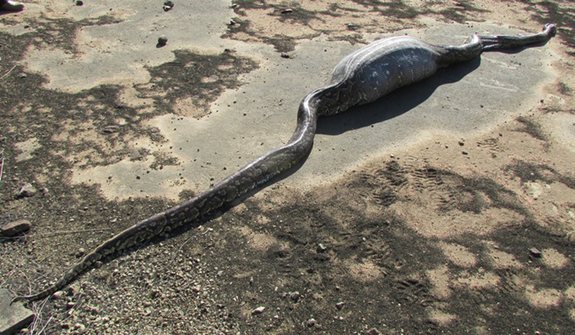 Rangers also took measurements of the snake’s massive body, which measured 12.8 feet (3.9 meters) long. The snake’s head features a dual set of lower jaws that move independently of one another, allowing the animal to open wide to swallow large prey. The first smog emergency for the Chilean capital in 16 years forced officials to shut down 3,000 factories and other businesses, and to order thousands of cars off Santiago’s roadways. 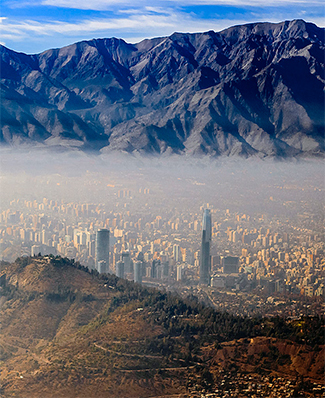 A toxic blanket of gray wintertime smog has covered the sprawling city for much of June, trapped by the Andes to the east and smaller hills around the capital. A temperature inversion in the lower atmosphere, typical during winter, provided a “cap” for the layer of smog. The stagnant air has been accompanied by the driest June in four decades, with no rain predicted for at least another week. Authorities recommended that the city’s 7 million residents avoid outdoor activities due to potential health problems that may be brought on by exposure to the smog. But the hazardous pollution peaked just as Chile was hosting the Copa America, with Santiago being one of the main venues. The federation organizing the soccer (football) competition does not allow matches to be canceled because of poor air quality. On 21 June 2015, the National IHR Focal Point of the United Arab Emirates notified WHO of 2 additional cases of Middle East respiratory syndrome coronavirus (MERS-CoV) infection. Between 24 and 26 June 2015, the National IHR Focal Point of the Republic of Korea notified WHO of 6 additional confirmed cases of Middle East Respiratory Syndrome Coronavirus (MERS-CoV) alongside 4 additional deaths. To date, a total of 181 MERS-CoV cases, including 31 deaths, have been reported in South Korea. 5.8 Earthquake hits south of the Kermedec Islands. 5.3 Earthquake hits Kepulauan Tanimbar, Indonesia. 5.2 Earthquake hits near the south coast of Papua, Indonesia. 5.1 Earthquake hits the D’Entrecasteaux Islands. Two 5.0 Earthquakes hit south of the Kermedec Islands.